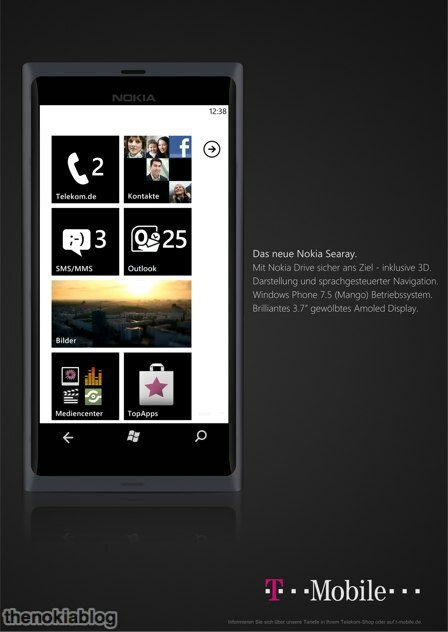 We’ve seen so many Nokia Windows Phone concepts lately, that we won’t even be able to tell them from the real thing… Supposedly, the real thing should look like the device pictured below, the Nokia Searay for T-Mobile Germany, that has just leaked. I guess we’ll see it for the first time officially at Nokia World 2011 at the end of October. Till then we can detail what we have here and the description in German says that the Nokia Searay offers 3D navigation, voice navigation, Windows Phone 7.5 Mango and a 3.7 inch AMOLED display. Notice the huge resemblance in design with the Nokia N9, not that it’s a bad thing, since that look was very hot when it debuted. Also, I hope that the name Genesis won’t stick, since it’s not catchy and should be replaced with something like W8 or W800 or maybe N1. As far as specs go, a recent leak mentioned that the Searay or Sea Ray, as some people spell it will use a Clearblack AMOLED display, a 1.4GHz CPU, 16GB of internal memory and an 8 megapixel Carl Zeiss camera.